You shake it on the dance floor, you sit on it, you show it off on the beach... Get the one part of your body that gets “left behind” into bootilicous shape! This treatment will make your skin look smoother, stimulate collagen production for a firmer fanny, & help with any zits you may have! Your skin is cleansed, extractions as necessary, then a masque is applied to nourish, finishing with an application of lotion.. Your booty will look soooo good! Shape 'em! Buff 'em! Scrub 'em! Love 'em! Your feet will thank you! This delicious experience begins with a foot soak in fragrant mango salts, next your feet are gently massaged with mango scrub to exfoliate and condition. Mango masque is applied to enrich and soften and of course your experience will finish with a foot and lower leg massage with mango buttercream... watch as your tired, overworked and aching feet are transported into happy feet! Oh and did I tell you this delicious experience includes a complimentary paraffin treatment for your hands! This Hydramemory Facial is like a drink for your skin! It is a deep hydrating treatment for your face, neck and décolleté that results in renewed moisture and silkiness. This treatment returns hydro-balance to the epidermis, which contributes in prolonging youthful skin and is ideal for all skin types. Now, you may be wondering what is a BoomaGlam? Jindilli created the BoomaGlam as a tribute to their Australian ancestors using the boomerang as inspiration to mold to the body's contours. Jindilli's BoomaGlam, used with Pure Macadamia Oil, delivers chemical-free, ritual cleansing for the whole body. Jindilli's ergonomically designed BoomGlam is for deeply effective muscle therapy in this exclusive signature massage. The rite begins with a relaxing full body massage using pure luxurious Macadamia nut oil, which is naturally anti-inflammatory, anti-microbial and hypo- allergenic. The treatment concludes with the ergonomically designed BoomaGLam, which molds to the contours of the body providing deep effective relief. This rite provides maximum results utilizing short firm strokes, working pressure points along the energy meridians and using the heel of the hand and the BoomaGlam for deep muscle relief. Trusted Regina Duct Cleaning expert shares a tip on why it is important to clean your dryer vent. According to the National Fire and Protection Association there was an estimated 16,800 home fires involving dryers and washing machines in 2010 and the leading factor contributing to ignition was failure to clean the vents. Trusted Regina mortgage professional shares a tip on reverse mortgages and empowering older homeowners. A Trusted Regina Mortgage Broker empowers older Canadian homeowners with smart, simple ways to use the value of their home during retirement. CHIP Home Income Plan is a home equity loan available exclusively to Canadian homeowners to convert a portion of your home equity into tax-free cash. But, unlike a traditional loan or mortgage, you never have to make a payment until you choose to move or sell – although you can make payments if you so choose. The CHIP Home Income Plan has other advantages over traditional loans or mortgages. For example, there are no income qualifications and once you receive the loan, it can never be recalled. It's called a Reverse Mortgage because unlike a traditional mortgage in which you make regular payments to a lender, the CHIP Home Income Plan pays you! You do not have to make any payments — principal or interest – for as long as you or your spouse lives in your home. There are many reasons that we are overweight and obesity resulting in health issues. Lifestyle behaviors (such as eating habits and exercise) can radically affect a person’s weight. Overweight is caused from an imbalance—eating too many calories and not getting enough exercise. One pound of fat is equal to about 3,500 calories. Stress can cause eating behavior and can cause overeating, and craving for foods usually high in sugar and fat. Stress eating can be a reason for weight problems. A person may choose not to walk to the store. Fast food restaurants are easy and on your way home from work. Someone may not know how to create healthy meals. Someone may snack on high in sugar and fat food rather than make healthy choices. Cultural background can influence weight and food choices. Foods specific to their cultures and regions of the country may be higher in fat and salt than foods from other areas. The affordability, availability of foods and ingredients, causes immigrant families to retain or discard certain traditional foods. They will start to eat like the rest of the American culture. This change can lead to obesity. Family gatherings offer large amounts of food and alcohol, and the opportunity to socialize as well as overindulge in less-than-healthy options. All fast food restaurants in America have “super-size” food. Lower income families are more likely to be overweight and it is usually because “junk food” is less expensive then healthy foods. Technology has led to more time spent in front of T.V and/or computers rather than physical activity. Commercials exposure us to food advertising. Genetics can play a role in obesity. However, genes do not always predict future health. Genes and behavior are both necessary for a person to be overweight. While genes can make one susceptible to becoming overweight, outside factors (such as lots of food supply or little physical activity) play a much larger role in the development of obesity than genes. Some illnesses lead to obesity and weight gain like polycystic ovary syndrome. Drugs, such as steroids, some antidepressants, and medications used to treat psychiatric illnesses or seizure disorders, also may cause weight gain. Poor sleep quality may lead to weight gain over time. Sleep apnea may lead to daytime sleepiness and make it much harder for an individual to begin or sustain an exercise program. Pamper him AND his vehicle! Dad deserves a gift that he will appreciate and feel treated by! Is he the type of guy who likes to pamper his vehicle? Pamper them both by sending him to the Oil Change Spa to relax while our experts take care of the car or truck he loves. We’ll make sure his vehicle is kept in tip-top shape. This is the kind of spa that dad will really appreciate! Now available – electronic gift cards – instantly redeemable – purchase securely – send to your loved one by email, Facebook, text or print. Press here for more information or to purchase. We have great hours and no appointment is ever needed. Our technicians have the expertise you need – some of our technicians have 20,000 oil changes under their belts. All work is warranty-approved which means the manufacturer of your vehicle recognizes the work that we do. We make recommendations based on information from the manufacturer of your vehicle. You choose the type of oil you want and add any other service we offer as desired. We’ll answer your questions or help you find the answer. Stay in your car and relax how you choose. Our friendly hostess will offer you a choice of complimentary beverage and something to read. Be entertained by our informative GCOC-TV or watch what is happening below with the undercarriage camera. Enjoy our free WIFI or even take a (short) nap. A top up of fluids is included in the service. A multi-point inspection is also included in the service including checks for leaks and the lights. We will give you an indication of problem areas in your vehicle if there are any. You choose what to do with the information about your vehicle from the multi-point inspection. Many of our customers love the complimentary air freshener and other extras like a dash wipe and garbage bag. To purchase a gift card securely online, press here. A convenient way to send a gift he will love! 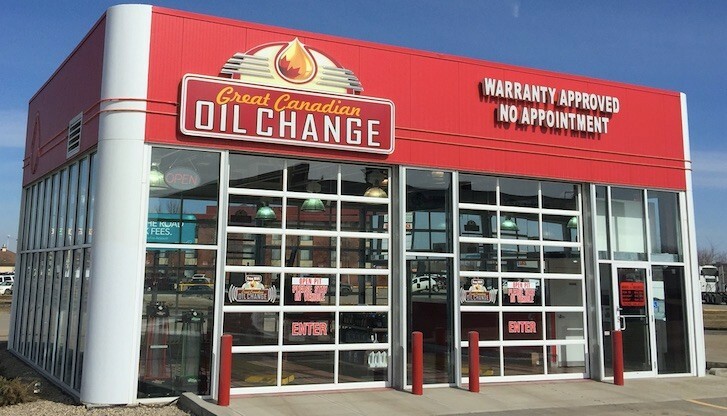 Great Canadian Oil Change Regina – serving Regina and area with pride. Great Canadian Oil Change on Quance Street and North Albert Street in Regina deserve the Thumbs up from www.trustedregina.com in our Regina Automotive General Category and they are Regina's Trusted oil change experts!